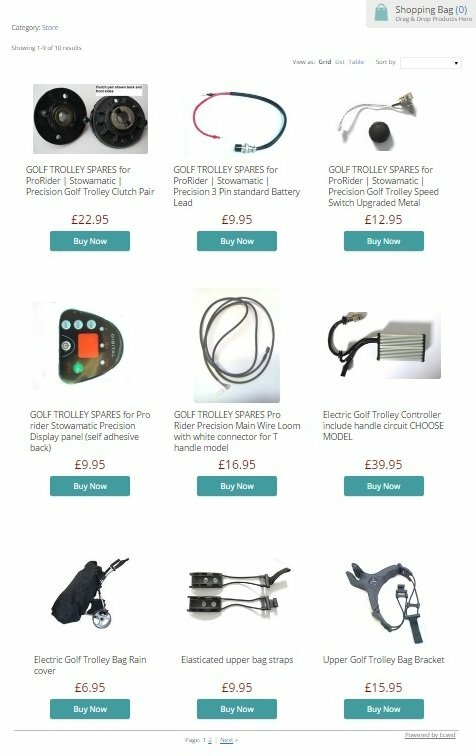 “Like to thank Jim for his after sale service, without his expert advice would have thrown away my old trolley instead the spare parts I got from Jim and his technical support, I now have a good as new usable golf electric trolley ! Golf Trolley Controller & Circuit, main wire. “Excellent price and very quick delivery. Communication was first class. Jim was very knowledgeable and extremely helpful. His website was the most helpful I have seen. Full of useful information and clear instructions on all possible trolley errors, with solutions. Wheel Clutches, Bag straps, Elastic upper straps. Just want to compliment you on your impeccable service supplying spares on two occasions for my power trolley. All items are very competitively priced. The instructions online are clear and concise. I was just fitting the new speed control I had purchased (I only saw the actual control in the mailing bag) when I realised that the nut off the original control was too big. I had already thrown out the mailing bag into my rubbish bin but something told me that Jim in electricgolftrolley.net is too on the ball for the new nut not to have been supplied. I retrieved the padded bag from my bin and sure enough, wedged down in the bottom corner of the bag was a nut and washer. Thanks so much for your attention to detail! My trolley’s back in action, great, because I’ve got a game tomorrow. I fitted the new board and controller and the trolley worked fine on Sunday. Thank you for all your help and advice very much appreciated. Thanks for very good service I will definitely recommend you to all my friends. Well done , the right part for the job, Great service – dispatched quickly and as described. The Golf trolley handle was as described and despatched very quickly. Thank you. WOW ! What a service, I though it was all over for my old trolley, this saved buying a new trolley, GREAT! To add your own fault and fix just go to our comments page and write your comment on what was involved and how it was resolved. OR go the bottom and fill in contact form. The more people we can help the better it is for all us golfers. Things to consider when deciding to purchase. Decide which golf trolley suits you and your golf from manual to electric and whether 18 hole battery or 36 hole battery. Understanding storage; size; erect and folded, weight, ease of use, should always be considered. Although our golf trolleys are very lightweight they are strong with a robust engineering, proven design and materials making them very durable and reliable. Advantages; a manual trolley will help in a significant way to relieving stresses and strains of carry your golf clubs especially a full round of 18 holes or even 36 hole double round. It is easily packed away and takes only slightly less room than the modern golf trolley. There is no need to worry about charging the battery. Disadvantages; although it takes the effort out of carrying your clubs it still does not relieve the tiredness of the normal golf round, it puts less strain on your joints by taking away the weight pressure but you still have to physically pull the golf clubs round the course. Going uphill with a push golf cart is as if not more difficult as carry your clubs. There is no shortcuts when coming to a green or teeing ground, you must not take the trolley manual or electric on to this ground. This is why all our trolleys are designed with a remote distance function allowing you to press the necessary distance button while you make your way to the next teeing ground. Storing your trolley is all about space required. With a manual there is slightly less space required but with nowadays designs there is not much between them. Where ever you store your golf trolley it is important especially in the UK’s climate of dampness, to store it in a dry place. If its an this is particularly important for the electronics built in the modern equipment. Remember the battery storage (see our FAQs for storage on this) always keep the battery charged every month never let it lie for the season to run down over time with out use or charging. The battery should never be allowed to run out EVER! How easy to transport fold away, size, weight etc. A consideration is how easily transportable it is. Although the modern designs are becoming better smaller, lighter, more compact, it is important to make sure you can transport your trolley easily and comfortably with room of course for your golf clubs. Weight is an issue if you struggle with an injury or disability as many can be heavy to lift, although our new latest aerospace aluminium grade is as light as some manual trolleys. Types of electric trolleys tend to come in either 18 hole 27 hole or 36 hole capabilities. Its all to do with the battery and efficiency of the motor and quality and lightness. Many of the battery sizes are 18Ah, 22Ah, 26Ah, 33Ah 36Ah for double motor remote control trolley. Our range comes with a standard size of 22Ah and extended size of 26Ah the maximum 36Ah made in the industry. This ensures it has more than enough power for their task. Lithium Batteries are also a consideration as the life cycles are much longer rather than in the 100s of life cycles it is in the 1000s for lithium batteries. One very important aspect is to make sure the product is reliable, strong, quality of standard Many are types of unknown brands and are often cobbled together with poor quality build, no recognised EU or consumer standards CE adhered to in their build and material process. Our brand is designed with a build and material quality we believe superior to all other brands on the market. Please find address complete the form to send an email.